PredictWallStreet, the global online stock prediction community, today announced the pairing of real-time stock and index quotes with real-time trader sentiment based on daily polls to facilitate faster data delivery which can result in more powerful intraday trading insights. Predictions from PredictWallStreet’s online community of thousands of traders and investors are aggregated and processed via proprietary collective intelligence algorithms to produce daily forecasts of stock and index movements. “We are pleased to provide the real-time market data delivery component to PredictWallStreet to support important investment decisions for their subscribers,” said Bill Chambers, Vice President and General Manager for Wealth Solutions at Interactive Data. Software AG’s Terracotta unit has introduced its Universal Messaging product, a middleware platform spanning enterprise to web to mobile connectivity, providing low latency performance and big data transport as appropriate – and aligning with the emerging ‘big data in motion’ paradigm. “Big, fast data at your fingertips requires seamless real-time data movement, no matter what type of system or device you are using,” says Eddie McDaid, managing director of Universal Messaging at Terracotta. Previously offered as part of the webMethods SOA middleware offered by its parent, Terracotta is integrating Universal Messaging with its BigMemory in-memory technology and In-Genius analytics offerings. The origin of the product is with my-Channels, which Software AG acquired in April 2012. Universal Messaging offers common APIs – for C++, C#, Java, VBA, .Net and Python – to support publish/subscribe, message queue and peer-to-peer communications. It also supports a number of different transports, from low-latency shared memory and multicast for enterprise applications, to fuller function sockets and HTTP/S for web and mobile. Indeed, the product supports a number of electronic trading services, including for FX and fixed income, from the likes of Deutsche Bank, UBS, Credit Suisse, JPMorgan Chase and Tullett Prebon. Azul Systems, the provider of Java runtime scalability, has announced the formation of a commercial partnership with Japanese financial technologies firm Simplex Consulting Inc. Under the agreement, Simplex will add Azul’s Zing Java Virtual Machine (JVM) to its portfolio of Java-based trading solutions which includes Simplex FX (FX trading platform), Simplex PRISM (derivatives front/middle office solution suite), Simplex BLAST (equities and listed derivatives front/middle office solution suite) and will promote Zing to its new and existing clientele. The combination of Zing and Simplex’s solutions aims to provide reliable, dependable and high throughput delivery of messages, low latency for market access or algorithmic trading, and high performance for large, memory-consuming risk calculations for various asset classes such as CVA (credit value adjustment) risk calculations. Following on from last month’s announcement of Ultra Messaging SMX, Informatica has published a range of latency and throughput performance figures for the shared memory transport, covering a number of programming languages. Messaging latency as low as 39 nanoseconds was recorded, with overall latency more than 16 times lower than tests conducted on an earlier version of the transport, conducted in May 2010. Ultra Messaging SMX is designed for messaging within a single server – in fact within a single multi-core chip, an architecture that has become increasingly adopted as Intel has rolled out its Sandy Bridge (and now Ivy Bridge) microprocessors – with up to 12 cores on certain Ivy Bridge chips. On chip cache memory is leveraged by SMX, since it is faster than fetching data from standard RAM. Latency tests were conducted between threads running on the same core (2 threads per core are supported by Intel) and between cores on the same chip. 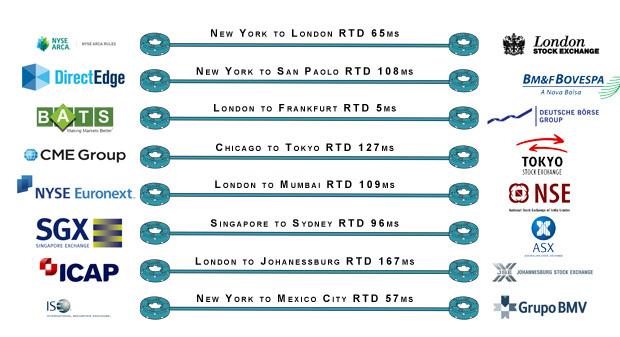 Throughput tests were conducted from one thread to threads across many cores on the same chip. Informatica did not test latency between cores across sockets, since it would have been higher than for a single socket. Informatica tested its transport against C, C# and Java APIs, noting that trading systems are often built using a number of languages and so such support is a typical requirement. The test systems for latency included one server with an Intel Xeon E5-1620, with 4 cores, clocked at 3.6 GHz, while for throughput tests a server with a (pre-release) 10 core Ivy Bridge chip, operating at 2.8 GHz, was used. CentOS and Red Hat Linux operating systems were hosts for the C and Java tests, with Microsoft Windows 7 Professional SP1 supporting the C# tests. * Thread to thread latency on same core, for the C API, and 16 byte messages, was 39 nanoseconds. The same for 128 byte messages was 48 nanoseconds, for 512 byte messages was 81 nanoseconds. * Thread to thread latency on a sibling core, for the C API, was 103 nanoseconds for 16 byte messages, 111 nanoseconds for 128 byte messages, and 135 nanoseconds for 512 byte messages. * C# and Java latencies were a bit higher. For example, latency for 512 byte messages between threads on the same core was 135 nanoseconds for C# and 106 nanoseconds for Java. * As an example of a throughput test, 16 byte messages were transmitted from one thread to up to 19 other threads on the same chip. With 19 receivers and the C API, throughput of 133.92 million messages/secomd was achieved, without batching of messages. Batching – which increases latency – increased this to 305.34 million messages/second. Informatica found that throughput increased nearly linearly as receivers were added. While the significant decrease in high frequency trading has reduced the overall need for such low latency transports, Informatica notes that it is still required for other trading operations and strategies, such as arbitrage, market making and smart order routing. S&P Capital IQ today announced the launch of its Portfolio Risk solution, an advanced risk and scenario analytics tool that provides traders, portfolio and risk managers with the ability to make decisions about the pricing, hedging and capital management of multi-asset class portfolios in real-time. Available on the S&P Capital IQ desktop, the product brings together leading risk and portfolio analytics acquired through last year’s purchase of R(2) Financial Technologies and S&P Capital IQ’s extensive market and reference data. The Portfolio Risk solution offers a fully integrated data and analytics platform, eliminating the need to invest in separate data to run risk systems. In addition, it gives users the ability to use interactive portfolio dashboards to aggregate data or drill down to the most detailed level of fundamental financials and research, enhancing understanding of impacts of potential changes on P&L at an actionable level. These views are comprehensive, yet easy to change and organized to suit individual needs. The Portfolio Risk solution covers a diverse range of asset classes from cash, fixed income and equities to exotic derivatives. By offering best-in-class instrument pricing, portfolio analytics, scenario analysis and stress-testing capabilities via shareable dashboards, it facilitates communication and collaboration around risk and investment strategies while also providing full transparency into underlying methodologies and on-the-fly calculations. These features ensure that risk metrics can be calculated quickly and that new scenarios or market strategies can be tested and acted upon swiftly. DataFluidics™, Reflex™, a revolutionary data processing platform for financial institutions. DataFluidics™, the innovative provider of ultra-low latency technology today announced the general availability of Reflex™, a revolutionary data processing platform for financial institutions. In increasingly fragmented markets where volume-driven automated strategies span time zones and hunt razor-thin windows of opportunities, modern trading desks can no longer be satisfied with the ability to make split-second decisions based on a single market data feed. Traders can no longer rely on single-exchange connectivity either. The new frontier of profitability dictates that advanced trading firms combine and analyze several data sources to reach a decision and instantly dispatch orders to multiple destinations. Yet many current infrastructures remain tied to legacy paradigms of single-input / single-destination whose performance dramatically erodes if multi-channel logic is retrofitted into them. Firms can no longer capture profits. Reflex was built differently. The fruit of several years of cutting-edge research, Reflex leverages the latest architectural paradigms combined with field knowledge of founder and CEO Daniel Kopko at some of the largest and most profitable firms on Wall Street. Reflex is optimized to enable the combination and correlation of several streaming data feeds to produce composite decisions based on highly-advanced scheduling and processing rules. With reactions capable of achieving ultra-low latency of 1.6 microseconds (with a 99 percentile of 2.5 microseconds), Reflex sets a new standard for software-based solutions which can now directly compete with more expensive alternatives such as custom FPGAs. Reflex can be licensed stand-alone or through OEM agreement as embedded technology to enable ultra-low latency trading decisions. The technology can also be purchased or distributed by third-party firms. Eurex Group continuously invests in deepening its understanding of the structure and dynamics of the markets it operates. Its proprietary data contains a wealth of information on each individual order, down to the level of trader ID and microsecond granularity timestamps. This data uniquely allows the exchange to conduct extremely granular research, which is more important than ever considering the public debate. The analysis is a contribution to much needed empirics in the discussion on HFT. Key to the credibility of any research on HFT activity is a solid process to identify which order flow is – and which is not – of HFT origin. Eurex Group argues that HFT is a technologically advanced implementation of a great variety of trading strategies – some of which already existed prior to the existence of electronic trading platforms. Therefore, the exchange’s HFT selection process is based on the technical (instead of functional) characteristics of its participants’ order flow. More specifically, the exchange’s research looks at the inter-arrival time of messages, measured by the number of microseconds between any two consecutive messages from any two different participants. To understand the underlying logic of the research, imagine a world wherein participants in a market place would not react on the exact same events when making investment decisions. In this world, the speed with which one reacts on any opportunity would generally not matter; there is no other participant hunting for the same opportunity. Therefore, from a system perspective, transaction arrival at the central exchange system would be uncorrelated. There would be a predictable number of observations with a small inter-arrival time and a somewhat smaller number of observations with a higher inter-arrival time. The expected number of observations for any inter-arrival time would be given by a Poisson distribution. In reality, trading activity is partly correlated and, since the rise of HFT, especially on a micro-second time frame. Therefore, there are observations in excess of what might be expected based on the Poisson distribution, particularly in the 0-100 microsecond time frame. These excess observations for very short inter-arrival times serve as a proxy for the ‘HFT-ness’ of a participant. On 25 August 2011, Eurex Exchange experienced one of the most challenging market situations in its history. An institutional investor (not an HFT participant) offloaded a 6,000 contract DAX® Futures position in a 20 minute period, causing tremendous price pressure. For comparison, the average turnover increased from 300 contracts per minute to more than 1,700 contracts per minute. As a result, the market in DAX® Futures briefly lost more than four percent of its value, making the event look much like the U.S. ‘Flash Crash’. However the situation was different in two very important respects. Firstly, although liquidity became more expensive, it did not dry up. Spreads widened and the number of available contracts declined, but these are natural consequences of increased demand. Arbitrage (against e.g. EURO STOXX 50® Index Futures, SMI® Futures, etc.) allowed participants to transfer liquidity from correlated instruments to DAX® Futures and vice versa. Trading continued in an orderly fashion, and the volatility interruption that halts trading when prices move too fast was not triggered. Secondly, HFTs continued to be an important source of liquidity throughout the event, supplying 30 to 50 percent of the contracts available at the best bid and offer. Contrary to what one might expect, their aggregate participation was not skewed to one side or the other. Of course, only an execution proves the relevance of an order. Therefore, it is also important to note that the HFT share of passive executions remained stable and high. Furthermore, contrary to popular belief, the majority of the aggressive side of those executions were not HFT participants. Last, but not least, HFT liquidity was spread out over several price levels at all times, reducing the price impact for large aggressive orders. Eurex Exchange keeps close contact with end users of its trading system, such as buy side investment firms. Discussions with traders at these firms have proven to be invaluable input for decisions regarding market structure and trading system design. The exchange takes their concerns about market structure very seriously and investigates specific issues wherever possible. An often heard criticism is that HFT liquidity is spurious; “Whenever I try to hit it, it’s gone before my order reaches the exchange”. To verify or falsify this claim, Eurex Exchange took all add, modify and delete orders and rebuilt the historical order book in EURO STOXX 50® Index Futures for several days from 2012. The exchange defined “large trades” as trades that were 10 to 20 times the 10-minute moving average trade size. In EURO STOXX 50® Index Futures, such trades occur between 400 and 500 times per day. For each 100 milliseconds (ms) in the two seconds around these trades, Eurex Exchange analysed the contracts available at the best price level on the side of the order book that was affected. Based on that, it was possible to calculate the share of contracts provided by HFTs and by non-HFTs respectively (adding up to 100 percent). Each grey lines depict the daily average market share of HFTs on the relevant side of the BBO before and after a large trade (10 times the trailing 10 minute average) in the front month Eurostoxx future. The blue line is the average of these averages. The graph shows that HFTs do not reduce their participation right before large trades and increase (rather than reduce) their market share of the relevant side of the BBO after large trades. The results can be found in the figure below. The grey lines represent the combined market share of the exchange’s top 40 HFT participants, whereas the blue line is the average of the grey lines. Remarkably, instead of reducing their participation, it can be seen that on average, HFTs significantly increase their share of contracts on the best price level of the side of the order book where a large trade occurs. Furthermore, it can be seen that the participation of HFT users does not change in the second prior to the execution of the large order. Therefore, the claim that HFT participants revoke their liquidity before a large trade hits the order book does not, in general, hold true. Over the past few years Eurex Exchange has seen a substantial increase in HFT activity. The exchange wanted to quantify the effect of increased competition among liquidity providing HFT participants on market quality. One of the areas it expected to see market structural changes was the resilience of the market; in other words: How fast does the market recover after a large trade? What happens after large trades hit the order book is extremely important as most trading is highly correlated; a slow recovery means unnecessary sub-optimal executions. The grey lines show daily averages for the spread recovery paths in 2010 and 2012. The blue lines are averages for 2010 and 2012. Compared to 2010, the liquidity in the DAX30 futures became much more resilient. The averages converge around 500ms from the big trade. To quantify the recovery process of market quality, the exchange measured the spread (in ticks) for each millisecond in the two seconds before and after the large trades that caused the spread to widen. Such events happen several hundred times a day in the front-month DAX Futures. Based on these measurements the exchange calculated daily averages for eight similarly volatile days in 2010 and 2012 (grey lines in the graph above). The chart shows the recovery paths relative to the average pre-trade spread to account for the effect of differences in intra-day volatility; a spread recovery of four ticks is more significant if the initial spread was one tick than if the initial spread was ten ticks. The top blue line is the average of the spread recovery paths in 2010 and the bottom blue line represents those paths in 2012. The most obvious difference between 2010 and 2012 is the significant improvement in the speed of the recovery that took place. Another observation is the fact that the recovery process in 2010 only started after 5-10 ms whereas in 2012 a much faster reaction can be observed. The exchange’s working hypothesis, supported by some early findings, is that these 5-10 ms was the minimum reaction time of some exchange participants, which – at that time – provided the lion’s share of the liquidity in DAX® Futures. According to the study, high-frequency trading activity is an important positive contributor to overall market quality and stability. The exchange will continue to analyse HFT activity and will share the findings with the industry. StreamBase acquisition strengthens TIBCO event processing & real-time analytics. Palo Alto, California – TIBCO Software has acquired StreamBase Systems the privately held provider of event processing and real-time analytics software. Financial details of the transaction were not disclosed. With the aquisition of StreamBase TIBCO will add streaming capabilities to its event processing portfolio, enabling big data to be processed in real-time to provide an event-based alternative to batch-centric big data architectures. HL Steam are teaming up with BlueBee in an Anglo-Dutch initiative to port the Ancoa market integrity platform towards FPGA-accelerated computer architectures. The main goal of the project is to demonstrate that it is possible with FPGA to more efficiently process real world workloads of financial trading data at a lower cost, both in dollar and in energy terms, reducing both capital and operational expenditure. As we see it, processing big data in financial markets requires a diverse computational approach. This means that using general purpose processors (CPUs) exclusively will not give you optimal performance. Certain parts of the processing will be better handled using GPUs, or other types of processor, if those operations need to be done on a large number of data elements in parallel. Field-Programmable Gate Arrays (FPGA) are becoming an increasingly popular computing option, as they combine the speed and energy efficiency of hardware, with the programmability and usability of general purpose processors (CPUs). FPGAs have been around for over 25 years, but can be notoriously difficult to program in a flexible, generic way, which is one reason why they have yet to gain the widespread popularity of GPUs despite offering great performance gains over CPUs and energy advantages. Bluebee, a spin-off from Delft University of Technology and Imperial College, has developed a methodology to substantially increase the ease and flexibility with which platforms with heterogeneous computing elements (including FPGA) can be programmed. The challenge here is in finding the right mapping of the application to the different processing elements, and with FPGA acceleration, to have hardware implementations of those functions for which substantial speedups are possible. Prof Koen Bertels, CEO of Bluebee, is delighted to work with HL Steam, a London-based team who are taking a unique data-centric approach to market integrity in financial markets. The two companies complement each other’s expertise in hardware and software, and form an ideal fit for BlueBee to prove the possibility of a significant increase in computing performance, by making FPGA available to big data applications in finance.